This morning around 4am our first grandchild was born! Ah! Now, that's a pot full of feelings! My husband and I have been blessed with four sons and one daughter. Our first three sons are grown and married to beautiful women, I adore each of them. Our youngest son is nine, and our baby is five, our only daughter! So, we have a large and growing family. 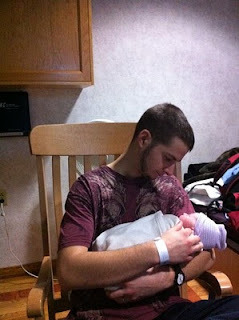 Our third oldest son, our first baby in the family, is the one who now has a new daughter. They haven't named her yet, she's so special it's been impossible to come up with the perfect name! So, at 4am, I got a text, from a son saying that she was born. I was already awake, so I pulled on my boots and headed to the hospital. When I arrived, our new grand daughter was at her mothers breast, and her daddy, my son was looking on. Oh, what a priceless picture! His oldest brother and his bride were in the room as well, excitment building. Soon, our oldest son and his wife walked in the room, and as I looked around at my three sons, their wives and this priceless baby it hit me that God has blessed me with such an abundance that I do not deserve. His love and constant walk with me has been so steady, even in the times when I have not walked with Him, what a blessing! He has given both my husband and I a family that loves us, He has given us faithful sons that respect us and take care of their wives. He has protected us and guided us. Yet, how many times have I complained and whined before Him? How many times have I not believed Him? Or felt unloved? How many times have I simply been unfaithful to Him? Yet, my God loves me and blesses me. He forgives me and shows me the truth of Who He Is. He brings to me miracles of reconciliation in relationships and He heals the scars. He blesses me. He blesses me, Bethany, because He loves me. He blesses me because I am His child and He wants to take care of me. As I was sitting there looking and listening to my own children and watching in wonder over my grand daughter, I wanted to cry! My love for all of them is so immense, so big and so fierce. I want to bless my own children, I want to give to their lives in abundance and share with them the passion of joy, the depth of life, the reality of Jesus. I want them to see and hear and know! Just as God wants this and more for me and all His children. Blessings of the soul and the heart. The blessings that bring me to a place where I am dancing and soaring with Him! It's called intimacy. Say That Again, God, because I want intimacy with you, and I want it with others. Your blessings are intimacies of the heart, Ah, just Say That Again!